As some of you are aware, sold my CB500s in June and bought a BMWf700gs What a machine, power and handling to match. Even with the low seat that I had on it, I was very unsteady at junctions, my feet only just touching the ground, too tall and too heavy for me, nearly fell off it three times in one day, that was enough of a warning for me, it had to go. My mate said, try a Honda CB500x, so I did, too tall again, just tip toes on the deck. Why don't these manufacturers cater for us small riders, the are missing out on a huge market, I love the look of the adventure bikes, but they are all too tall. 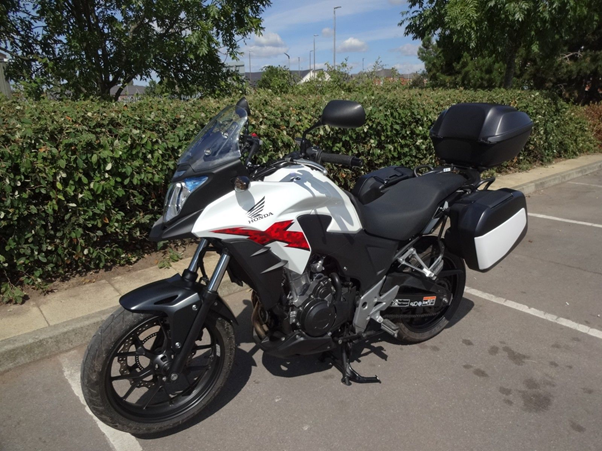 Anyhow, I digress, as if by Magic a CB500x appeared on Autotrader, with lowered suspension and full Panniers and top box and all the other bits, Heated Grips etc. Bought it...…...can sit on and touch floor and it is sooooo much lighter, will let you guys know how I get on. Welcome back! You'll have to pop up a photo of your new ride! I also loved the adventure bike image until I got one only to realise these tall heavy bikes are teh horror. To make things worse it was my first motorcycle. I sold it instantly with great determination, barely covering 300km with it. Perhaps we should have a sweepstake on when Fair Weather Rider gets a CB5 94-03? @GollyGosh wrote: Perhaps we should have a sweepstake on when Fair Weather Rider gets a CB5 94-03? Is the CB500x that bad then? Well it is 10bhp down you know. Certainly does not feel like it, very responsive on the throttle handles and steers well. Took it for a 50 mile run today and was well impressed. Wouldn't say it was better that the CB500s but as good. Hi James, how are things? did you get your rear brakes sorted? Posting piccy's of CB500X, sorry it's been so long, getting much more used to it now and loving it. But i know myself and the temptation of all the Rally Raid suspension options mean i would end up spending enough to have bought the zzr1400 i really want..!! Know the feeling, I have spent a load already, taller screen, gear indicator, now looking at silencers.